What constitutes rightful ownership of cultural objects? The unprecedented looting of modern wars as well as various protest movements have spawned international regulations, declarations, and efforts that offer guidance in this regard. The extant framework, however, falls short of exhausting the ethical problems raised by artifacts, their histories, and their displays. For museum and university collections these questions have gained the greatest urgency. 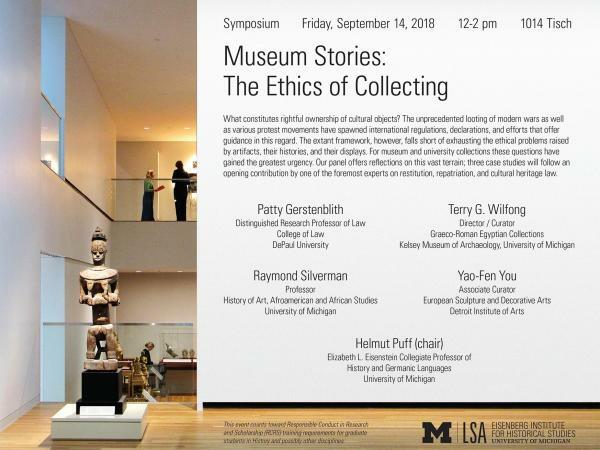 Our panel offers reflections on this vast terrain; three case studies will follow an opening contribution by one of the foremost experts on restitution, repatriation, and cultural heritage law. Note: This event counts toward Responsible Conduct in Research and Scholarship (RCRS) training requirements for graduate students in History and possibly other disciplines.